Emma Tytherleigh and Juan Cortés have teamed up to bring you professional, highly skilled and fun equestrian entertainment. From our well established outdoor arena shows, to a selection of our trained 4 legged performers with displays tailored for your corporate or private event, we have it covered. Our unique collection of equines can also be hired for film, television and photographic work. 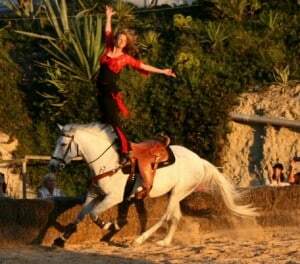 From elegant traditional Spanish riding to fun fast paced equine stunts plus lots of entertainment for shows across Spain. E.E.E are Spain’s premier equestrian display team, offering a wide variety of performances and catering for both small or large venues. Our unique equine displays have been entertaining audiences for over 2 years now are quickly becoming a firm favourite with event organisers across the Costa Blanca. E.E.E’s unique offering means we can provide any event with a show large or small. 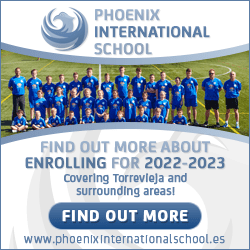 We’ve travelled 100s of miles around Spain over the past 2 years and have had the pleasure of performing to crowds in a variety of locations, from Channel 4’s Grand design house, Casa La Pedrera right up to the giant IFEPA Stadium at Torre Pacheco. We also enjoy performing at smaller charity venues and events where the audience can witness some of the finest horsemanship they will ever see. Majestic black stallion horse and carriage, elegant traditional Spanish riding to fun fast paced equine stunts plus lots of entertainment for shows across Spain. E.E.E are Spain’s premier equestrian display team, offering a wide variety of performances and catering for both small or large venues. Our unique equine displays have been entertaining audiences for over 2 years now are quickly becoming a firm favourite with event organisers across the Costa Blanca.